Shop BunnyBuryBaby online at BunnyBuryBaby.com for all your baby needs. BunnyBuryBaby carries all the name brands you've come to love and some you might not have discovered yet. Brands such as Adiri, Maya Wrap, Admiral Road, Melody Press, Ah Goo Baby, Aimee J, MiYim, Amy Michelle, Moby Wrap, Argington, Moco Babies, Azur, Morgan Avery, Baby Bunch, My Blankee, Baby Gift Basket Company, My Perfect Memories, Baby Soy, Nest Kids, Baby Sparewear and many more. BunnyBuryBaby has nursery items, nursing items, cloth diapers, blankets, diaper bags and much more. Save on your next purchase from BunnyBuryBaby.com with BunnyBuryBaby discounts, BunnyBuryBaby savings, BunnyBuryBaby promotions and BunnyBuryBaby coupons from 58coupons.com. 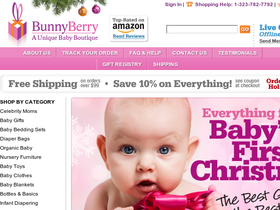 Enjoy free shipping from Bunny Bury Baby on orders of $75+. Click link to get started. Hurry on over to BunnyBuryBaby.com to get a 10% discount on Albums & Brag Books with this code. These are in limited supply! Save 10% on stainless steel bottles from Bunny Bury Baby when you use this coupon code. Click to view. For a limited time only BunnyBuryBaby.com is offering 10% off Organic Clothing with this coupon code. While supplies last. Save 5% with this coupon code from BunnyBuryBaby.com on Zooper Strollers. Click link to start saving.